When I work on the weekends, the last thing I want to do is make lunch and dinner to eat at work. At my local Hy-Vee (grocery store), I recently found Dr. McDougall's right food big cups. Today's review is for the Ramen variety. Q: How easy is this to make? A: Very easy! It takes about 2 minutes in the microwave after adding the spice packet (included) and water. Q: What would you compare this to? A: Ahh...you don't really need to know what I ate in college. But since you're curious, (pre-veg) I used to eat the chicken flavored ramen with a quarter bag of frozen "peas and carrots" dumped into it. (no, Jen-nay Forrest Gump references, please!). But this is exactly what it tastes like to me: freshman year of college. I just need to not gain that fifteen pounds again! Q: How's the sodium level on that? A: Not too shabby! This is a big cup of ramen - definitely 2 servings, as suggested on the cup. However, for one serving, there is only 320mg of sodium. For a ramen-replicate and for being completely processed food, I'd say that's not bad. Q: Did it fill you up? A: Honestly? YES! I didn't realize that the cup was 2 servings, so about 3/4 of the way through the bowl, I pushed it aside because I was super full. Then, I realized that I'm an idiot and didn't read the nutritional facts. Q: Would you buy this again? A: Yes. And I plan to in the near future. This is great for my desk drawer at work - I'll keep a couple in there for emergency needs or "I forgot to grab my lunch off the kitchen table" kinds of days. P.S. 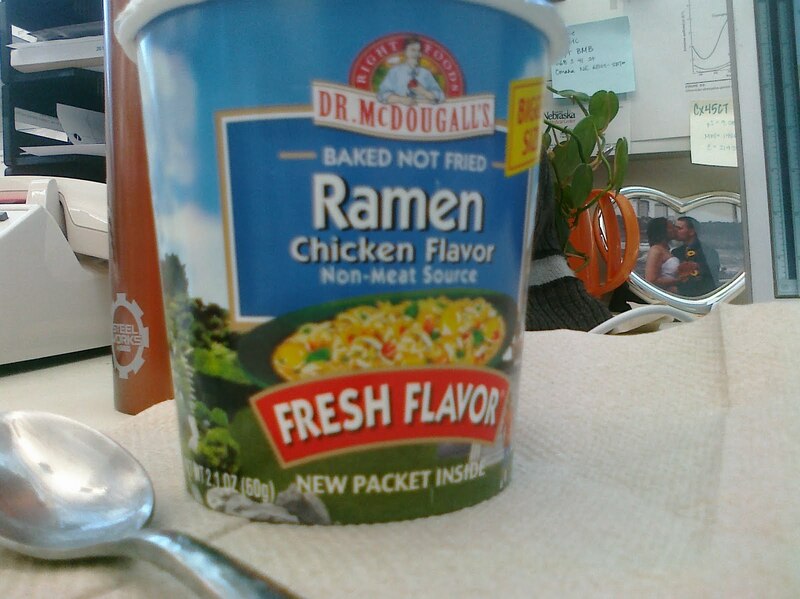 If your local store doesn't stock this, you can purchase the ramen bowl (and other soup bowls) on Dr. McDougall's website. OK come over for dinner this week! Only if you go to 24 with me!